Sunny, dry weather mixed with a breeze help set a three acre fire near Millpond Park in Eatonville. Photo courtesy of Michelle Pate. 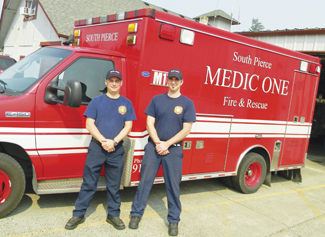 Two firefighters from South Pierce County Fire and Rescue pose in front of an ambulance. Photo courtesy of Colby Hess. South Pierce County firefighters are worried 2019 is going to bring a busy fire season after two large fires in the area ravaged acres of dry grass this week. It started around 8 p.m. on Tuesday South Pierce Fire Chief Lloyd Galey said, when a brush fire started near Millpond Park. The fire grew to about three acres. The only structure that was even in remote risk was the Eatonville water treatment facility, which is made of cinderblock with a metal roof. South Pierce Fire and Rescue, Grahm Fire and Rescue, Pierce 23 Fire and Rescue and Thurston County fought the fire. Just after 1 p.m. on Wednesday, a large brush fire crossed State Highway 702 near the intersection at Jackson Road East. 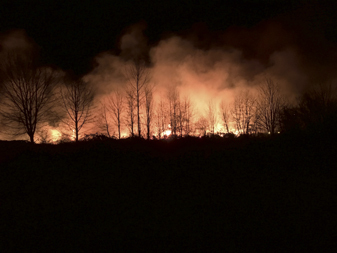 The brush fire grew to 45 acres and closed down nearby businesses and the highway. South Pierce Fire and Rescue, Grahm Fire and Rescue, Orting Valley Fire and Rescue, Lewis-McChord Fire and Emergency Services, Pierce 23 Fire and Rescue, and the Washington Department of Natural Resources responded to the blaze. "There's not usually this many fires this early," Galey said. "We have had a few days of sun, warmer temperatures and enough of a breeze to create a risk." Galey said these fires are indicating a long season for rural fire districts, who are used to fighting large blazes. Both fires are under investigation. Galey said South Pierce Fire and Rescue have investigated the fire near Millpond Park but have not found any conclusive evidence that suggests how the fire began. "Unfortunately due to the nature of the fire we had to dig near the point of origin," he said. "So that affects our investigation." Because of the location and size of the fire near State Routh 702, the Department of Natural Resources is investigating the fire. The investigation is ongoing and so far there is no explanation of how the fire started. On Friday, Galey worried the ongoing nice weather would mean more fires for his staff to respond to. "It's sunny out here with just the perfect breeze," he said. Since Monday, March 18, firefighters responded to 50 wildfires in Washington state, with 49 of those were on the west side, according to the Washington Department of Natural Resources website. This is an anomaly for the state. "Offshore, easterly winds are a known, somewhat common, critical fire weather pattern for Western Washington where high pressure sets up east of the Cascades and low pressure on the west side," Washington State Department of Natural Resources Meteorologist Josh Clark stated on the site. "These winds usually come with warm and very dry conditions that promote considerable west side fire activity." In 2018, wildfire investigations found most wildfires in Washington state are human-caused. Galey said he understands that some fires are accidents. He cited a fire in Eatonville the year before which started because a piece of farm equipment struck a rock, which started a fire that burned down a local farmer's entire field. "We can't control everything," Galey said. Even so, it's up to residents to use best practices to protect their homes and community from fires during the unusual season. Eatonville residents are allowed to burn vegetation and yard waste if they receive a permit from South Pierce Fire and Rescue. These burns are restricted to four-feet by four-feet, should be supervised and burned in an area clear of debris and vegetation. "We have a lot of people who start the fire then go to do something else," Galey said. "Then the fire gets bigger than they expect and they try to tame it before calling us because it's gotten out of control." Permitted yard waste fires are restricted to day-time use only. Burning must end after sunset, Galey said. Galey said it is important for all homeowners to have defensible space around their property, especially close to their homes. Defensible space is a perimeter around a house that is clear of tall vegetation, dead grass or any other fire risks. The recommended defensible space is a 30-foot perimeter around a house. "Prevention is simple," the Washington Department of Natural Resources states. "Don’t have anything dragging on your car. Put out your campfire (drown it, stir it and make sure all embers are out). Know the wildfire risk in your community. Check conditions before lighting a burn pile." To see what fire risks are in your area, visit https://fortress.wa.gov/dnr/protection/firedanger/.